A baby girl made an unscheduled arrival when she was born at a South Yorkshire bus station. Baby Destinie was delivered by a customer service adviser in the staff kitchen of Sheffield's Arundel Gate bus interchange. The baby girl's mother, Katie Couldwell, was waiting for a bus when she unexpectedly went into labour. "I've never had to deliver a baby, but my first aid training must have kicked in," said staff member Rebecca Hall. Destinie was delivered soon after she stepped in, while they waited for an ambulance to arrive. Ambulance phone operators talked Ms Hall through the baby's delivery along with father, Gavin. She laid down coats and towels and made sure Ms Couldwell was safe, then followed the ambulance operator's instructions. Image caption Rebecca Hall said:"The arrivals we usually deal with aren't as dramatic as Katie's, but my day to day job is to help customers, so that's all I did." "I'm so glad they're all OK and I'm happy I was able to help," she added. 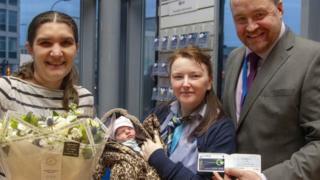 Tim Taylor, of South Yorkshire Passenger Transport Executive (SYTPE), said it was the first birth in one of its bus station and presented Ms Couldwell with a free travel pass and a bunch of flowers. "We're delighted for Katie, Gavin and their family on the birth of baby Destinie," he said. "We're also very proud of Rebecca for handling the situation in the most professional, brave and calm manner, and can't commend her enough." Ms Couldwell returned to the bus station with her baby daughter to say thank you. "I felt the baby coming and I knew I needed to get an ambulance," she said. "I wasn't scared as I have had other children, but within seconds of my waters breaking, Destinie followed." Paramedics took them to the Hallamshire Hospital for further treatment. Ms Couldwell said: "It must have been Destinie's destiny to come into the world that way."